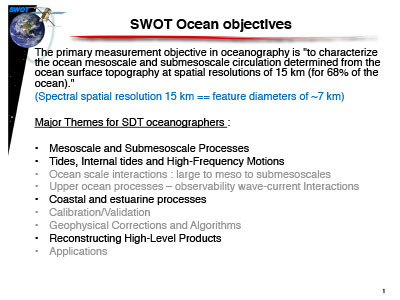 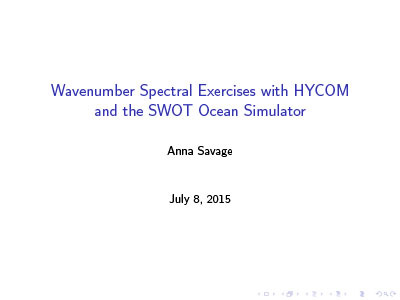 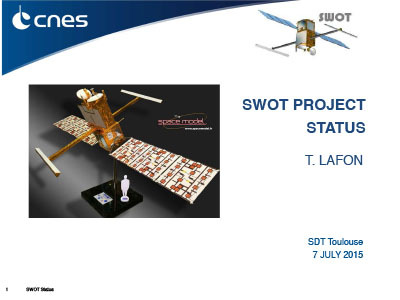 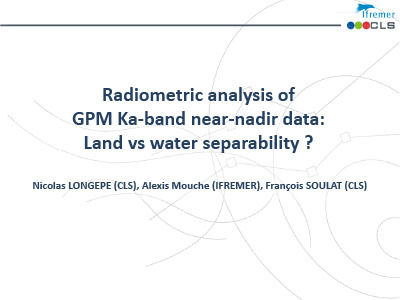 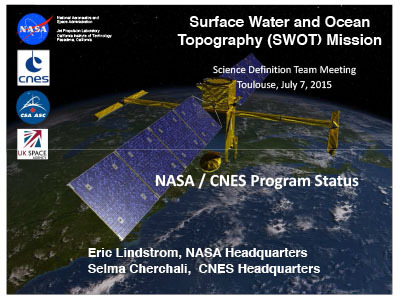 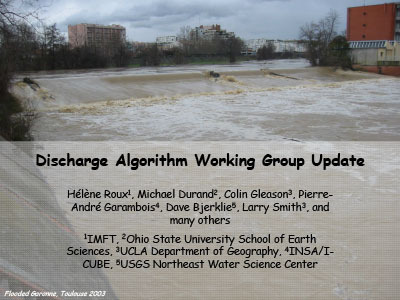 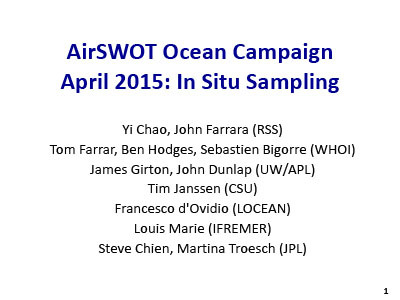 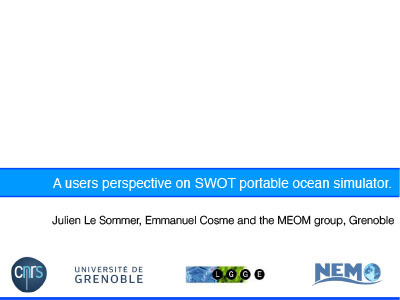 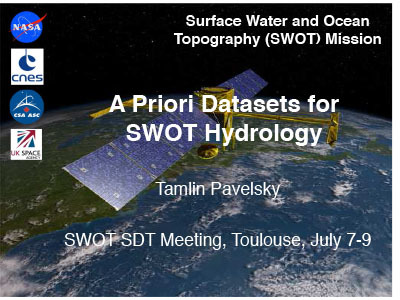 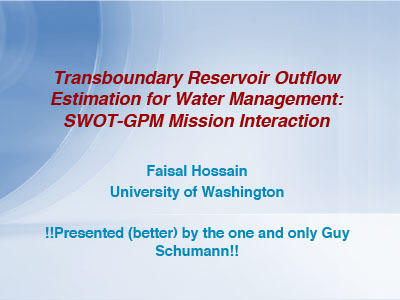 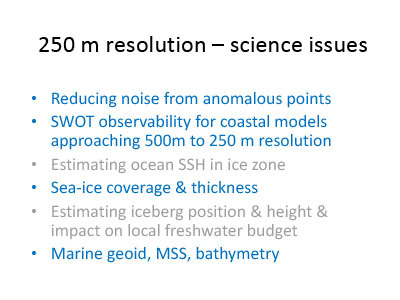 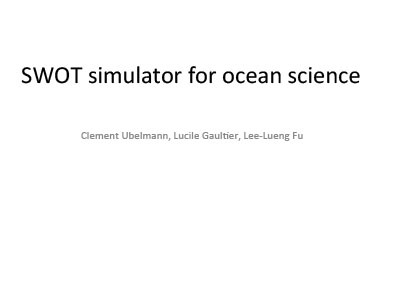 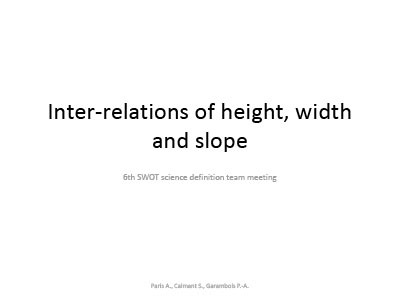 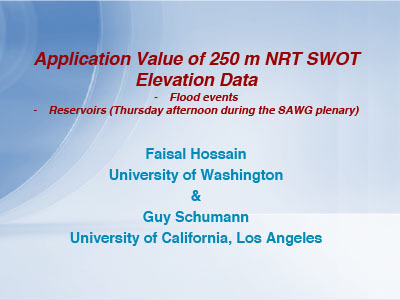 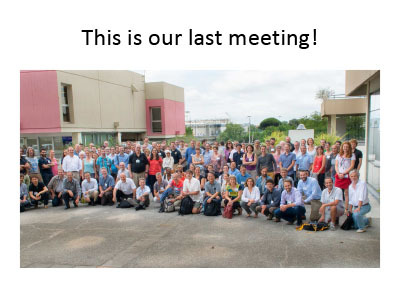 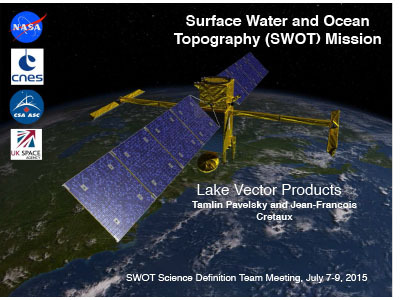 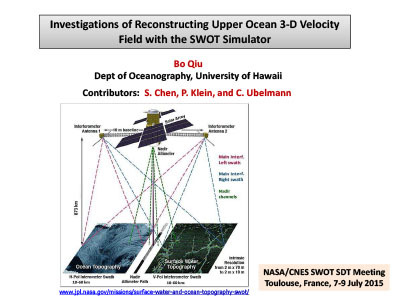 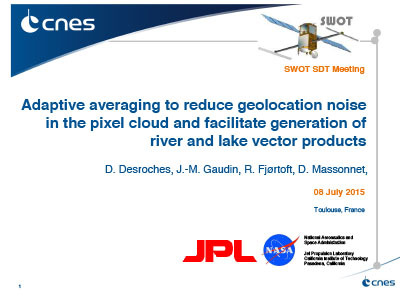 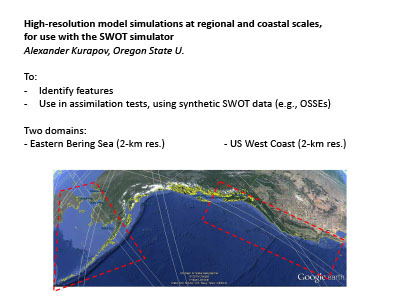 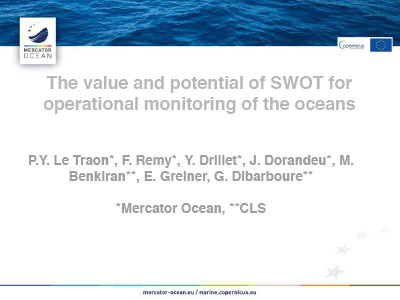 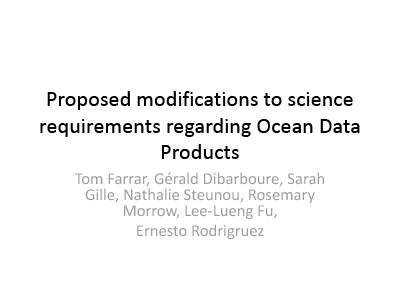 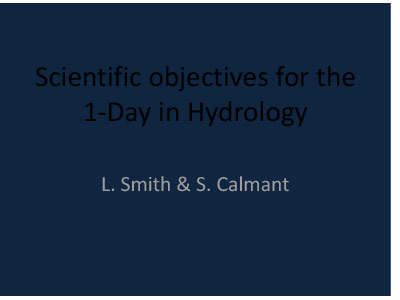 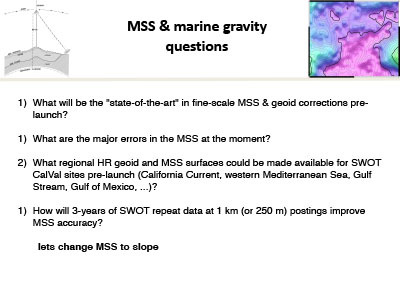 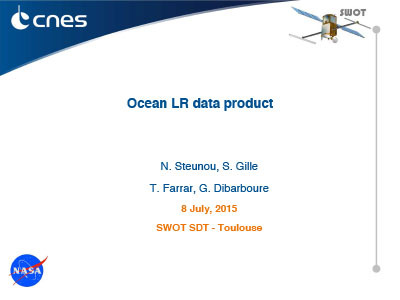 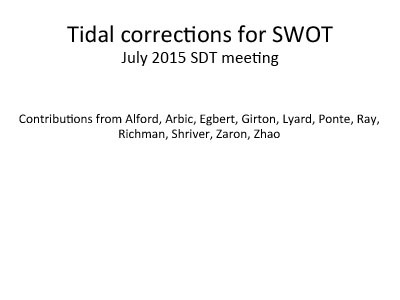 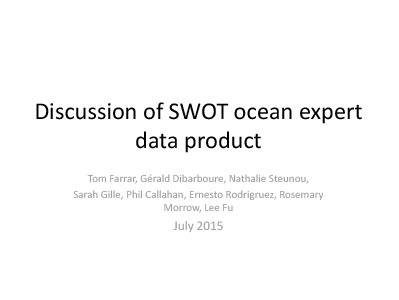 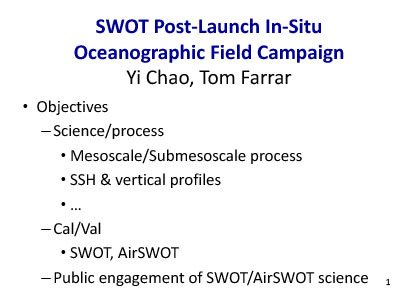 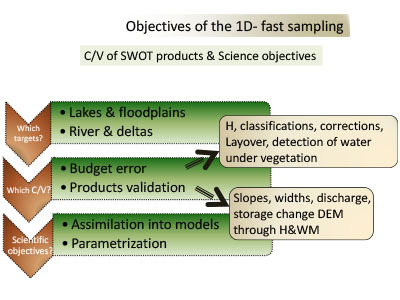 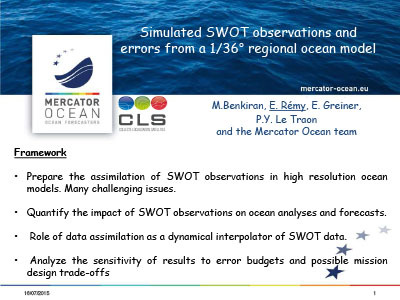 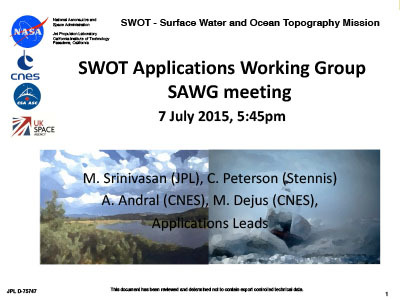 The Science Definition Team (SDT) of the Surface Water and Ocean Topography (SWOT) mission held their last meeting in mid-July 2015. 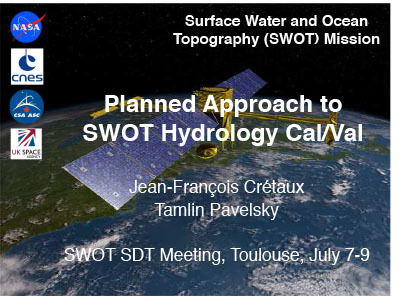 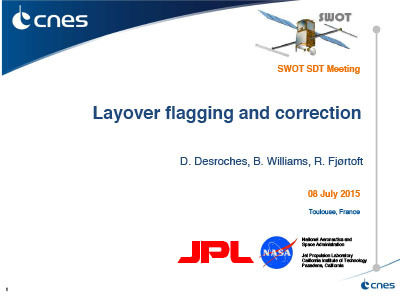 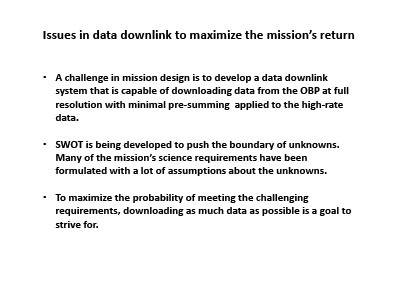 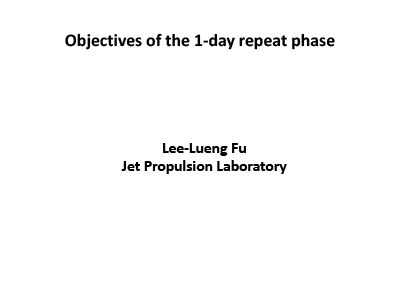 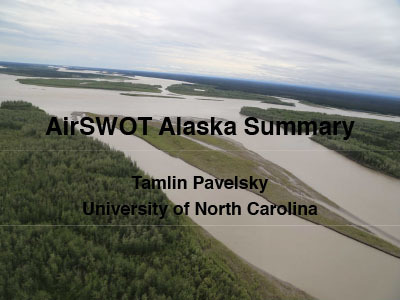 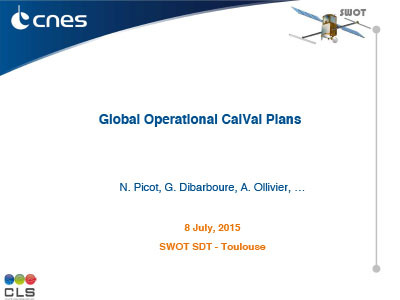 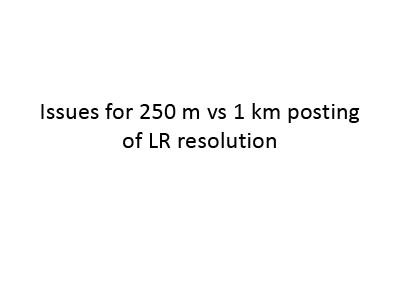 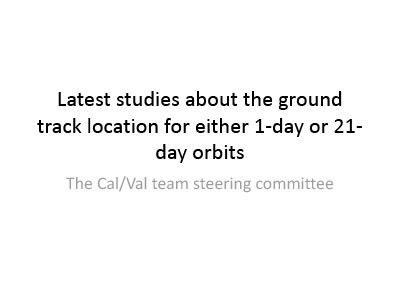 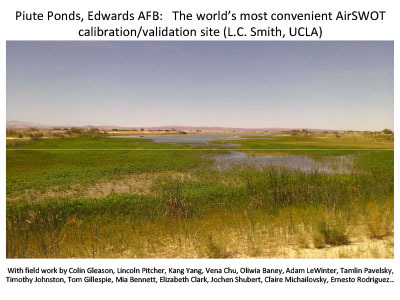 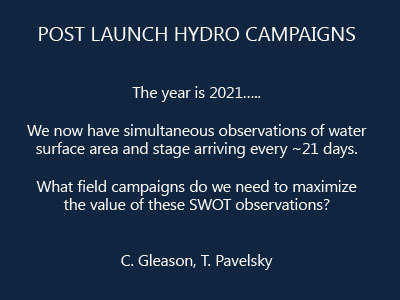 Over 80 presentations were given, focusing on scientific objectives for the one-day repeat phase of the SWOT mission and beyond, along with detailed calibration/validation plans. 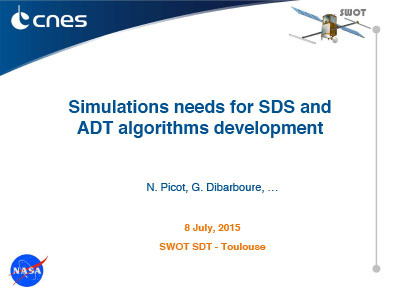 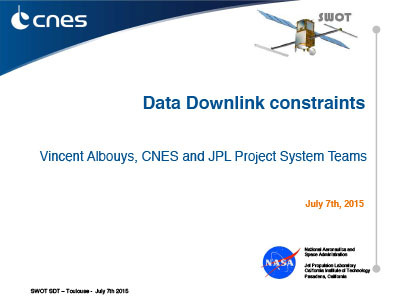 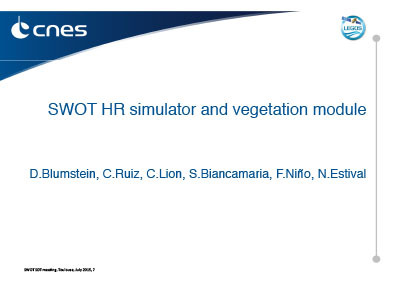 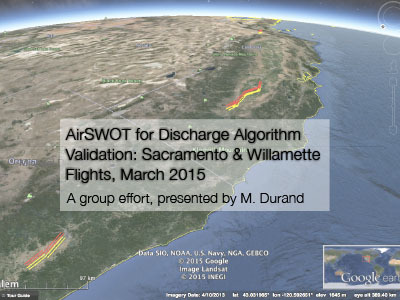 The SDT also discussed SWOT model simulations and data products. 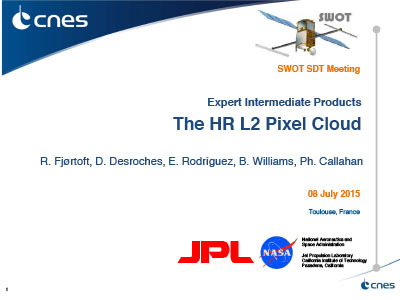 [08-Jul-15] Le Sommer, J. and Cosme, E.
[08-Jul-15] Durand, M., Humphries, E., and Ricci, S.
[08-Jul-15] Desroches, D., Gaudin, J-M., Fjørtoft, R., and Massonnet, D.
[08-Jul-15] Chao, Y., Farrara, J., Farrar, T., Hodges, B., Bigorre, S., Girton, J., Dunlap, J., Janssen, T., d'Ovidio, F., Marie, L., Chien, S., and Troesch, M.
[07-Jul-15] Hossain, F. and Schumann, G.
[07-Jul-15] Rodriguez, E. and Picot, N.
[07-Jul-15] Rodriguez, E. and Calmant, S.
[09-Jul-15] Calmant, S., and Rodriguez, E.
[07-Jul-15] Roux, H., Durand, M., Gleason, C., Garambois, P-A., Bjerklie, D., and Smith, L.
[08-Jul-15] Farrar, T., Dibarboure, G., Steunou, N., Gille, S., Callahan, P., Rodriguez, E., Morrow, R., and Fu, L-L.
[09-Jul-15] Hausman, J. and Masters, D.
[08-Jul-15] Fjørtoft, R., Desroches, D., Rodriguez, E., Williams, B., and Callahan, P.
[09-Jul-15] Picot, N., Dibarboure, G., and Ollivier, A. 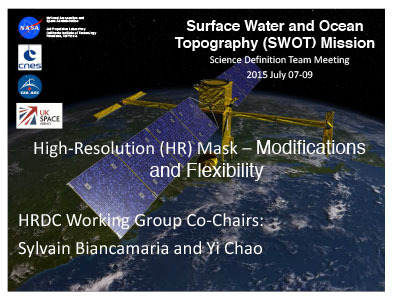 [08-Jul-15] Biancamaria, S. and Chao, Y. 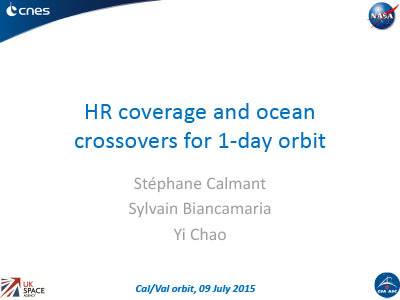 [09-Jul-15] Calmant, S., Biancamaria, S., and Chao, Y. 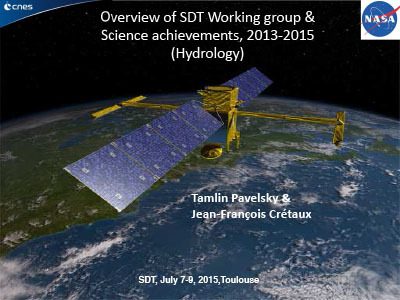 [07-Jul-15] Pavelsky, T., Cretaux, J-F., and Rodriguez, E.
[07-Jul-15] Pavelsky, T. and Cretaux, J-F.
[08-Jul-15] Morrow, R., Picot, N., Rodriguez, E., and Fu, L-L.
[07-Jul-15] Paris, A., Calmant, S., and Garambois, P-A. 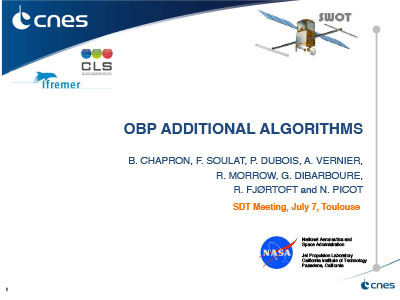 [07-Jul-15] Fu, L-L. and Morrow, R.
[07-Jul-15] Dibarboure, G., Morrow, R., Steunou, N., Picot, N., Fjørtoft, R., Soulat, F., Dubois, P., Gille, S., and Farrar, T.
[08-Jul-15] Pavelsky, T. and Cretaux, J-F.
[09-Jul-15] Rodriguez, E., and Calmant, S.
[08-Jul-15] Desroches, D., Williams, B., and Fjørtoft, R.
[07-Jul-15] Pavelsky, T. and Esteban-Fernandez, D.
[08-Jul-15] Dibarboure, G., Pujol, M., and Schaeffer, P.
[07-Jul-15] Lindstrom, E. and Cherchali, S.
[07-Jul-15] Chapron, B., Soulat, F., Dubois, P., Vernier, A., Morrow, R., Dibarboure, G., Fjørtoft, R., and Picot, N.
[07-Jul-15] Esteban-Fernandez, D., Peral, E., Pollard, B., McWatters, D., and Clark, D.
[09-Jul-15] Gille, S., Steunou, N., Farrar, T., and Dibarboure, G.
[08-Jul-15] Steunou, N., Gille, S., Farrar, T., and Dibarboure, G.
[09-Jul-15] Cretaux, J-F., and Pavelsky, T.
[09-Jul-15] Gleason, C., and Pavelsky, T.
[08-Jul-15] Steunou, N., Pottier, C., Albouys, V., and Esteban-Fernandez, D.
[08-Jul-15] Farrar, T., Dibarboure, G., Gille, S., Steunou, N., Morrow, R., Fu, L-L., and Rodriguez, E.
[08-Jul-15] Longepe, N., Mouche, A., Soulat, F.
[07-Jul-15] Srinivasan, M., Peterson, C., Andral, A., and Dejus, M.
[09-Jul-15] Smith, L., and Pavelsky, T.
[08-Jul-15] Peral, E., Esteban-Fernandez, D., and De Bleser, J-W.
[08-Jul-15] Benkiran, M., Rémy, E., Greiner, E., and Le Traon, P-Y. 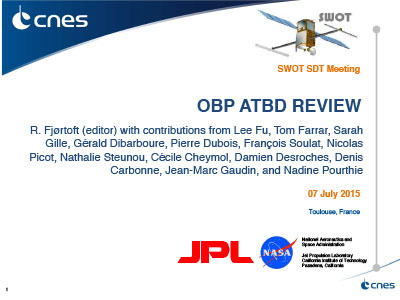 [08-Jul-15] Picot, N. and Dibarboure, G.
[09-Jul-15] Fu, L-L., Morrow, R., Cretaux, J-F., Pavelsky, T.
[09-Jul-15] Andral, E., Dejus, M., Peterson, C., and Srinivasan, M.
[08-Jul-15] Blumstein, D., Ruiz, C., Lion, C., Biancamaria, S., Niño, F., and Estival, N.
[07-Jul-15] Esteban-Fernandez, D. and Steunou, N.
[09-Jul-15] Chao, Y., and Farrar, T.
[07-Jul-15] Vaze, P. and Lafon, T.
[08-Jul-15] Ubelmann, C., Gaultier, L., and Fu, L-L.
[08-Jul-15] Brown, S., Obligis, E., and Picard, B. 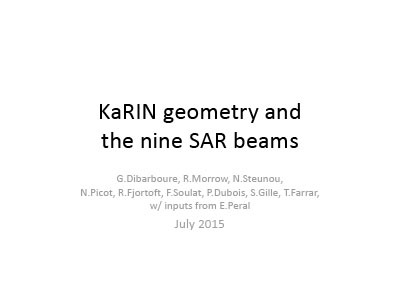 [09-Jul-15] Le Traon, P-Y., Remy, F., Drillet, Y., Dorandeu, J., Benkiran, M., Greiner, E., and Dibarboure, G.
[08-Jul-15] Alford, M., Arbic, B., Egbert, G., Girton, J., Lyard, F., Ponte, A., Ray, R., Richman, J., Shriver, J., Zaron, E., and Zhao, Z. 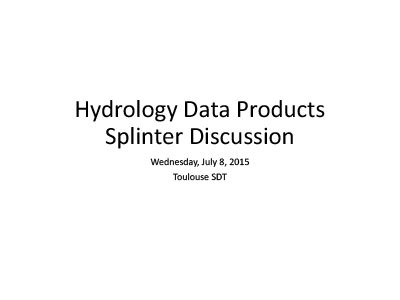 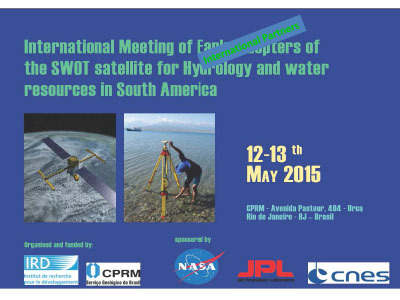 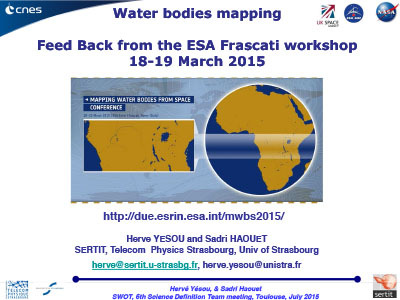 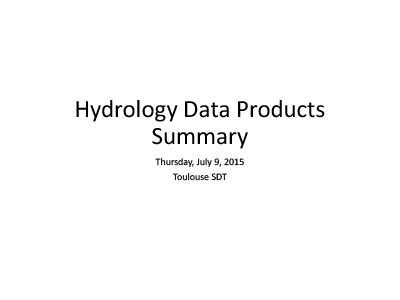 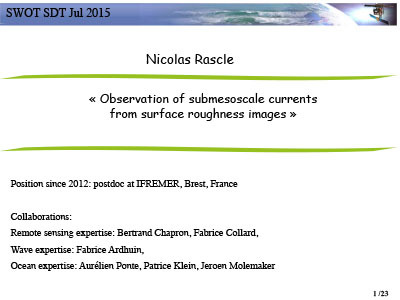 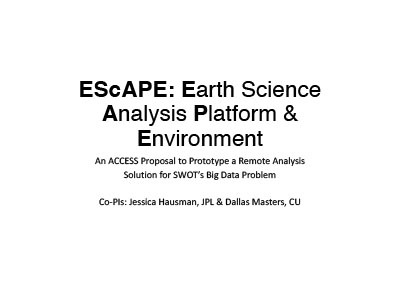 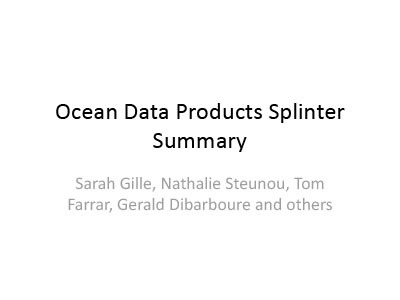 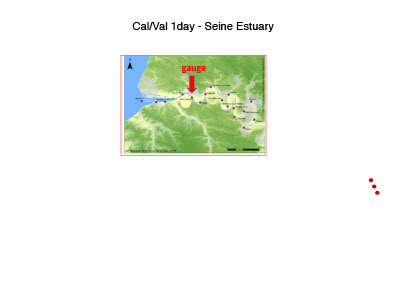 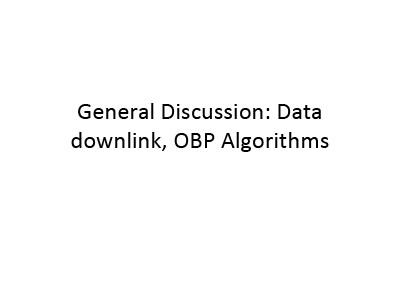 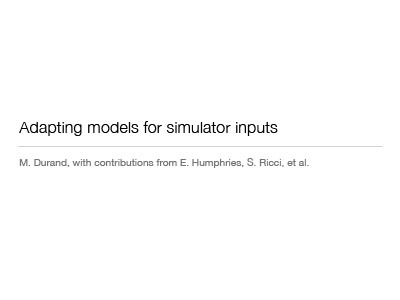 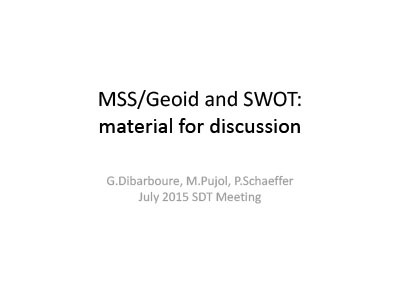 [07-Jul-15] Yesou, H. and Haouet, S.
[07-Jul-15] Peral, E., Rodriguez, E., and Esteban-Fernandez, D.